John Sullivan is a pianist and conductor. He is a native of Cambridge, MA and graduated from Harvard University in 2009 with a degree in music. At Harvard, he directed the undergraduate Dunster House Opera for two seasons, preparing and conducting performances of Mozart's Marriage of Figaro and Così fan tutte, and served as the 42nd music director of the Bach Society Orchestra. 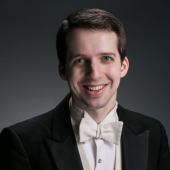 Since 2013 he has been the accompanist and assistant conductor of the Concord Chorus. He holds several other accompanist positions, including for the Harvard-Radcliffe Chorus, in addition to freelance teaching, accompanying, and coaching. He is Music Consultant and annotator for Toscanini releases on the Immortal Performances label.